Contact angle, θ, is a quantitative measure of the wetting of a solid by a liquid. The instrument of choice to measure contact angles and dynamic contact angles is an optical tensiometer. A force tensiometers can also be used. Both optical and force tensiometers enable static and dynamic contact angle measurements. Contact angle is defined geometrically as the angle formed by a liquid at the three-phase boundary where a liquid, gas and solid intersect. The well-known Young equation describes the balance at the three-phase contact of solid-liquid and gas. The interfacial tensions, γsv, γsl and γlv, form the equilibrium contact angle of wetting, many times referred as Young contact angle, θY. From the figure below, it can be seen that the low contact angle values indicate that the liquid spreads on the surface while high contact angle values show poor spreading. If the contact angle is less than 90° it is said that the liquid wets the surface, zero contact angle representing complete wetting. If contact angle is greater than 90°, the surface is said to be non-wetting with that liquid. Contact angles can be divided into static and dynamic angles. Static contact angles are measured when droplet is standing on the surface and the three-phase boundary is not moving. Static contact angles are utilized in quality control and in research and product development. Contact angle measurements are used in fields ranging from printing to oil recovery and coatings to implants. When the three-phase boundary is moving, dynamic contact angles can be measured, and are referred as advancing and receding angles. 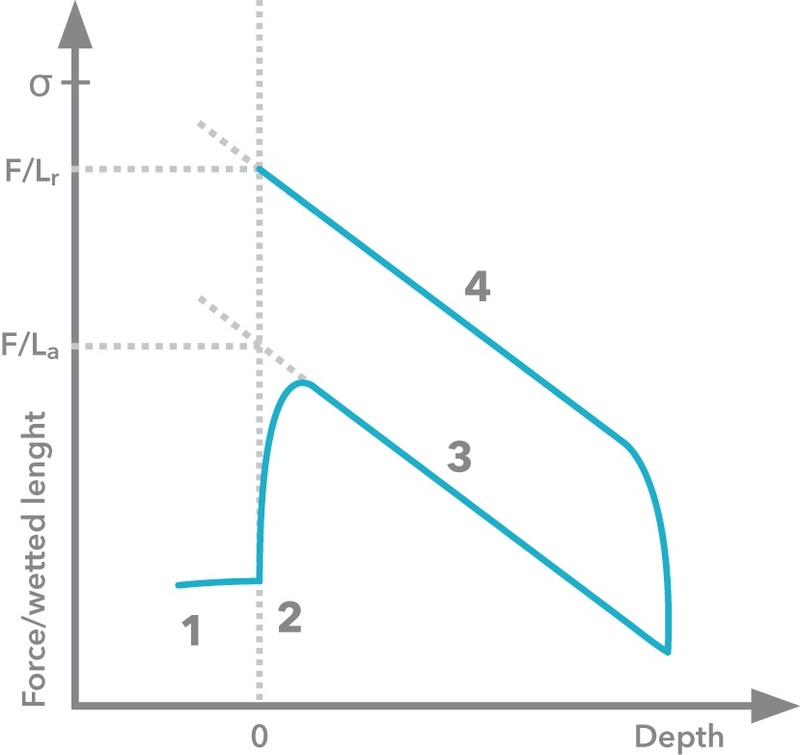 Contact angle hysteresis is the difference between the advancing and receding contact angles. Contact angle hysteresis arises from the chemical and topographical heterogeneity of the surface, solution impurities absorbing on the surface, or swelling, rearrangement or alteration of the surface by the solvent1 2. Advancing and receding contact angles give the maximum and minimum values the static contact angle can have on the surface. Both optical and force tensiometry can be used to measure contact angles. Both techniques are described below with comments on the choice of either technique for particular applications. Both static and dynamic contact angles can be measured by using ;Theta optical tensiometer. In practice, a droplet is placed on the solid surface and the image of the drop is recorded. Static contact angle is then defined by fitting Young-Laplace equation around the droplet, although other fitting methods such as circle and polynomial can also be used. Dynamic contact angles can be measured by using two different approaches; changing the volume of the droplet or by using tilting cradle. Figure 2 (a) shows the principle of the volume changing method. In short, a small droplet is first formed and placed on the surface. The needle is then brought close to the surface and the volume of the droplet is gradually increased while recording at the same time. This will give the advancing contact angle. The receding angle is measured the same way but this time, the volume of the droplet is gradually decreased. In Figure 2 (b), the principle of the tilting cradle method is shown. The droplet is placed on the substrate, which is then gradually tilted. The advancing angle is measured at the front of the droplet just before the droplet starts to move. The receding contact angle is measured at the back of the droplet, at same time point. Schematic of dynamic contact angle measurement by using (a) volume changing method (b) tilting cradle. Dynamic contact angles can be measured by using Sigma force tensiometer. Force tensiometer measures the mass affecting to the balance when a sample of solid is brought in contact with a test liquid. The contact angle can then be calculated by using the equation below when surface tension of the liquid (γl) and the perimeter of the sample (P) are known. In the figure below, a complete contact angle measurement cycle is presented. As can be seen, with force tensiometer the measured contact angle is always dynamic contact angle since the sample is moving against the liquid. When the sample is immerged to the liquid the advancing contact angle is recorded and when the sample is emerging the receding contact angle is measured. The sample is above the liquid and the force/length is zeroed. The sample hits the surface. For the sample as shown, with a contact angle < 90°, the liquid rises up causing a positive force. The sample is immersed, buoyant force increases causing a decrease in force on the balance. Forces are measured for advancing angle. After having reached the desired depth the sample is pulled out of the liquid. Forces are measured for receding angle. The force tensiometry is an excellent choice when dynamic contact angles on the homogeneous, regularly shaped samples need to be measured. Analysis of single fibers, such as wetting of hair, is handled easily by our sensitive force tensiometer. In addition, force tensiometer is the best choice, when lose powder or pigment-wetting properties are measured.